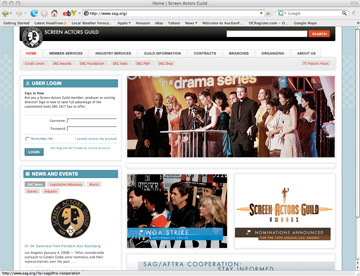 Screen Actors Guild launched their "New and Improved" website today. It's definitely more user friendly and more intuitive so that visitors to the site can find things easily and not get lost among the many levels, not to mention many tiresome mouse clicks. Best of all, the main page of the website featured many of my photos I took for the Guild through the years. :-) Yay Me! Please click here to view their website.